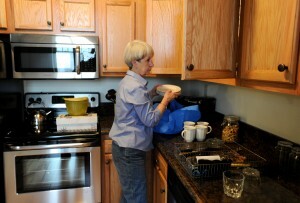 Jason McKibbenJason McKibben – jmckibben@poststar.com Anne Powers moves dishes into the kitchen cabinets of her new Warren Street Square apartment in Glens Falls on Wednesday, October 26, 2011. The complex, with a mix of commercial and residential space in a rehabilitated carriage factory, is the latest in Glens Falls to offer a downtown living experience. Tamarra Cararra Ellsworth, another Warren Street Square tenant, said she drives to her job as a team leader at the C.R. Bard plant, about a mile away, but that’s because she likes her new car. “I just got a Lexus, so I definitely drive to work,” she said. They may be young professionals or 50-something singles and couples approaching retirement age, but usually they aren’t young families with children. 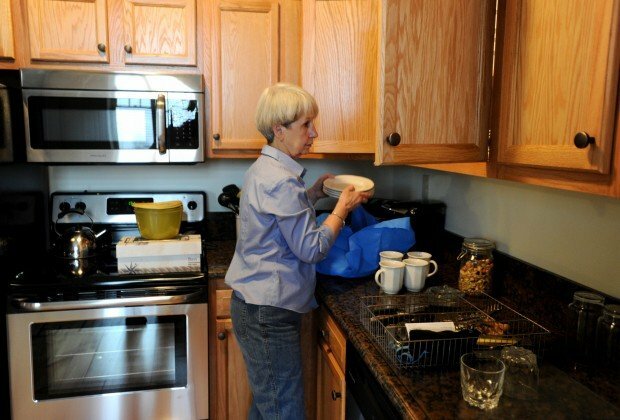 “You know, the granite countertops and that sort of thing,” Ellsworth said. Another 30 apartments are planned for the Renaissance Plaza, formerly the Godnick’s Grand Furniture store, on Glen Street. “We’ve always been involved in the library and other things downtown,” said Ben Pratt, who with his wife, Mary, moved to The Mill about 18 months ago. “We were empty-nesters at that point. The kids having gone to college and gone to graduate school and being out on their own,” he said. Pratt said there are a few types of businesses he’d like to see downtown that aren’t there now. “The first thing that would be great is if there were a kind of high-end deli, bodega (Latin-American style market) kind of place where you can get some groceries, some fresh vegetables and stuff like that during the week,” he said. “We go to the farmers market every Saturday, and that’s great. But it’d be nice to have like a Putnam Street Market kind of thing,” he continued, referring to a popular upscale market in Saratoga Springs. “That’s the primary things, and obviously you always want more retail,” he said. “A good clothing store for average people – and groceries,” she said when asked what type of stores she has to drive to patronize now. Powers, a surgical nurse at Glens Falls Hospital, said her car has about 48,000 miles on it, and her expectation is it will be the last car she ever owns because she’ll primarily be walking. “I’m near work. I’m near church. I’m near the library. I’m near the coffee shops,” she said. Powers said she’s thrilled with new her apartment, with its hardwood floors, brick walls and wood beams but modern kitchen and laundry fixtures. “It has character. … Oh, it’s beautiful,” she said.